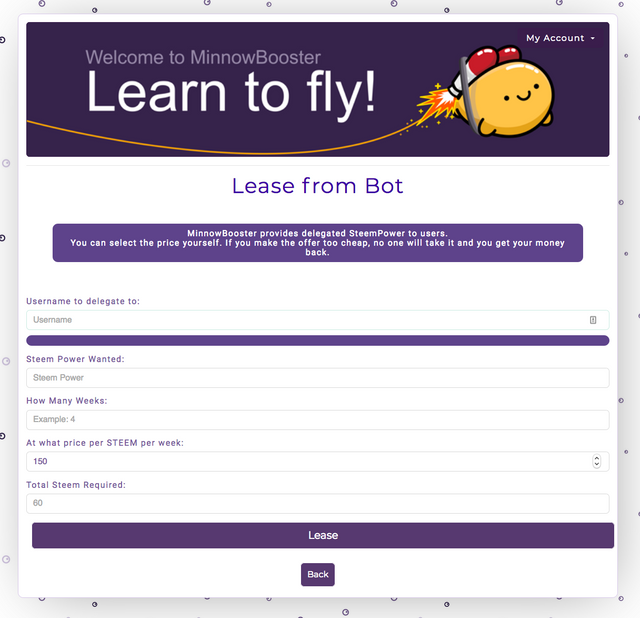 MinnowBooster Update: New Custom Lease Prices Available! Hi everyone! Minnowbooster and its staff are absolutely stunned at the growth we've just seen in SBD and Steem prices! Currently, Minnowbooster is experiencing a massive number of lease requests for Steem Power in our Delegated Leasing Market. 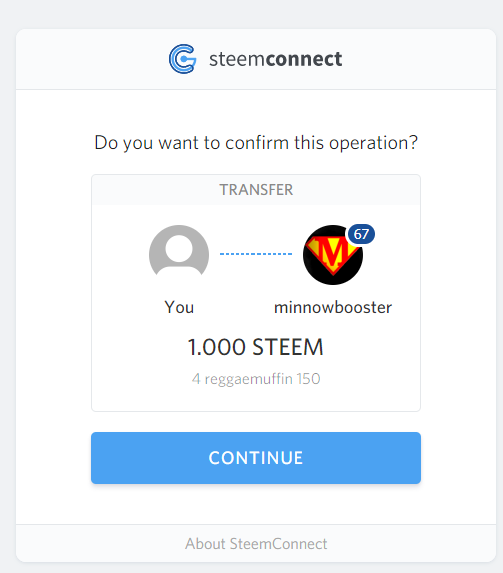 We would like to formally invite minnows and other Steem users to come and join our DLM by creating a custom request to lease Steem Power at our website, www.minnowbooster.net. We've added the ability to set your own price for Steem Power leases giving you a better chance to get your lease filled by a willing donor! Act now and lock in a good price for Steem Power while this feature is still being reviewed by the masses! Why would I want to lease Steem Power? Leasing power from investors can help you grow your account, get more followers, support authors and artists you follow with more significant upvote values, as well as give higher visibility to content you deem worthy. Okay, I am sold! How do I lease SP from Minnowbooster investors? 4.) Enter the price in Steem per week you are willing to pay. 5.) The calculator will show you the total amount of Steem required to receive the lease. 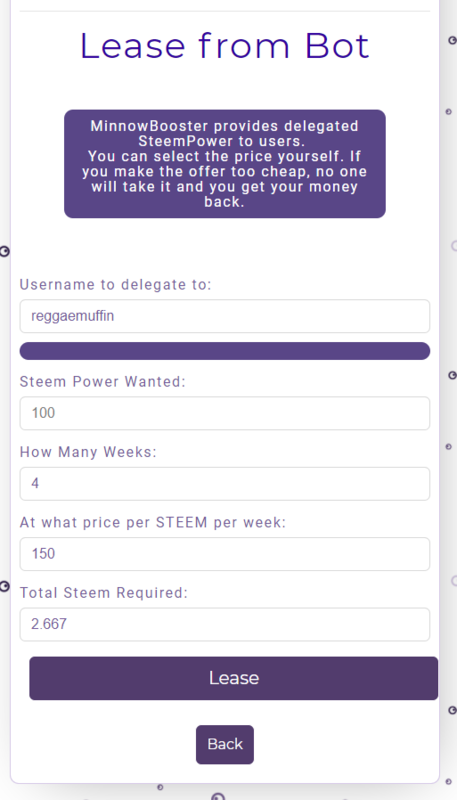 For example, reggaemuffin would like to lease 100 Steem Power for 4 weeks. They are willing to pay a premium to receive the lease today so they have set a price per Steem per week at 150. The calculator has automatically filled in the Total Steem Required field to 2.667 Steem. Once you click the "Lease" button you will be taken to a secure Steemconnect authorisation page, which will require your Active WIF key to authorise the transaction. First, the @minnowbooster account tries to fill the lease, but if it cannot, the order will go to the market, to be filled by investors. 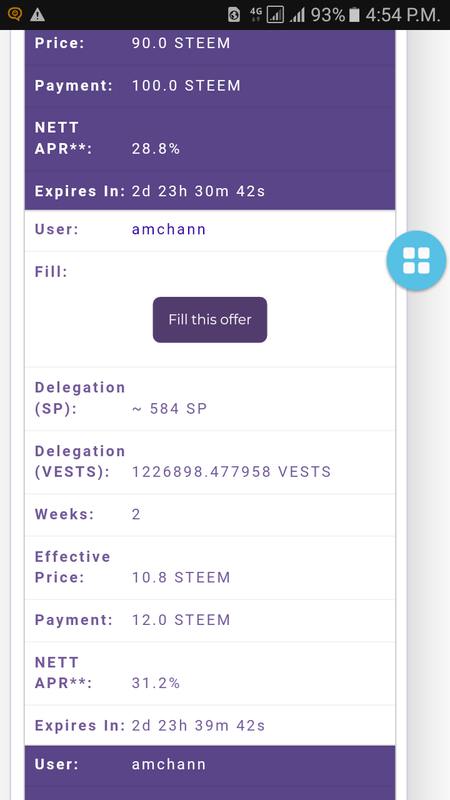 If the order cannot be filled within 3 days, your STEEM will be returned. 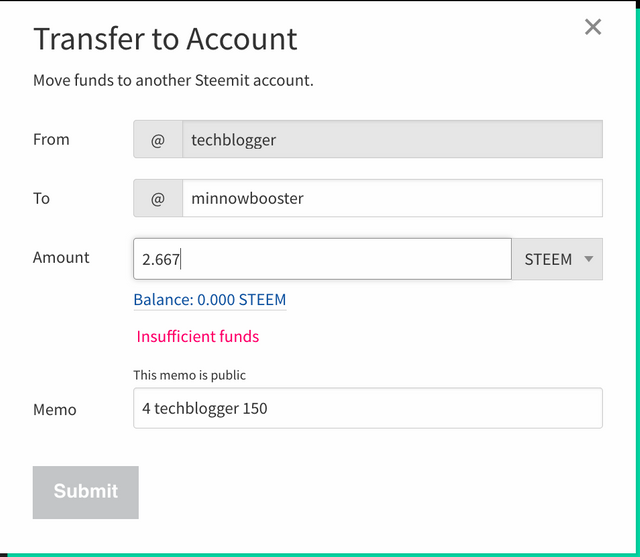 You can send a memo to @minnowbooster with your Steem payment and the number of weeks in memo in numerical form. The sending account will receive the lease. Thank you again for your continued support as we work on providing the most socially beneficial toolset on Steem. Don't forget @minnowbooster has got your back! Please remember, that while we are a business and work for a profit, that we share 90% of our income with the various investors in our services. There is no other booster available which shares it's rewards with such a diverse set of people on the Steem BlockChain. 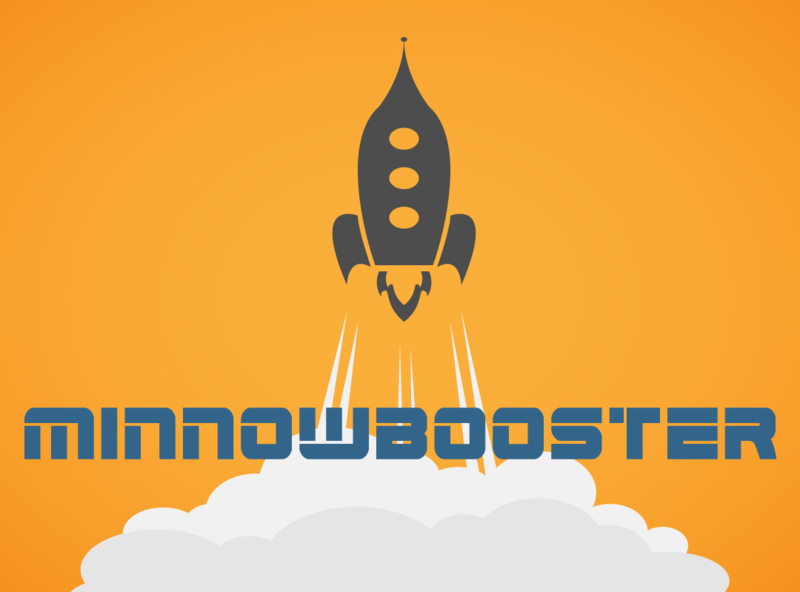 Minnowbooster : Sell Your Vote to MB for SBD! Upvote Bot Market (UBM) Revealed! Minnowbooster Upvote - 15 Minute Delay Policy and New SBD Limits for Upvotes. And last but not least, here's our cute little footer made by the most epic @ryivhnn! Yes, there are cute little minnows floating around! nice job guys! One piece of feedback. This line sounds confusing. Can it be simplified? "At what price per STEEM per week:"
Changed to How many SP per STEEM per week: thank you a lot! ur welcome. "How much Steem are you willing to pay per 100 SP per week?" I have taken delegated SP from open market place. My question is Can I renew it before due date ??? Happy New Year, I have attempted to obtain a lease for around 10 days; unfortunately without any success. Is there currently a backlog? You can no longer have any delegation! the first system was much better! I agree, I have applied twice and I did not get any SP. But then with the price changes everyone wants to buy a lot of Delegated SP as Steem is cheaper now. This is an excellent change. Many thanks. 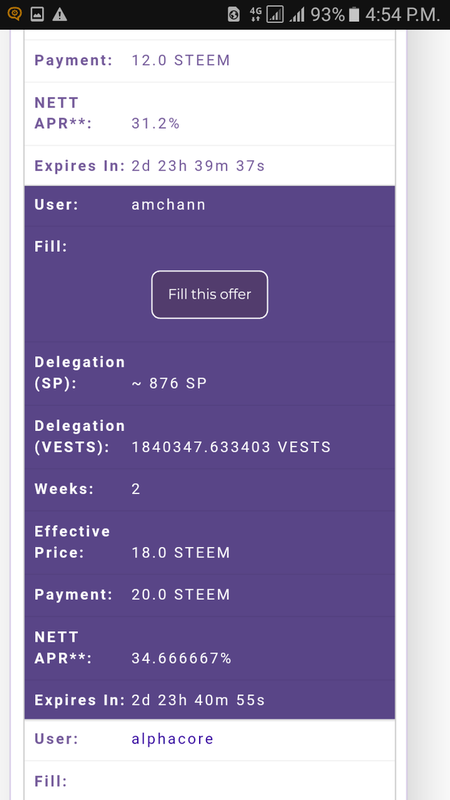 Can you please consider adding the STEEM-per-week rate to the message to the delegator when a lease is renewed by the delegatee? the refund is possible for pending requests so we can make new and valuable offers rather then waiting for 3 days expiry period. here are the two active request. kindly cancel both of them. thanks for prompt response sir. I don’t see any refund yet ? How long does it take to come through ? With the big fluctuation in SBD and Steem prices it is a good idea to let users decide what APR they want to target. Thanks. Maybe this will be a stupid question. The vote value is based on current price right? So with the increase of the SBD(let's say it's $11 atm) price, the 135% fixed return will be calculated from for example $11x1.35 or the pegged $1 SBD price? Paying 2SBDs worth $22 for a ~$2.7 vote would be quite expensive. :D Hopefully I am wrong but the number strangely stays around that $2*1.35 number for the last 20 mins. Minnowbooster considers 1 SBD worth 1 SBD in post worth. That the internal market is boosting the SBD price to hell and beyond is a sad thing but nothing we can plan in. Since there is no reliable source of what the current SBD price is, we can't peg to it. You got a 0.49% upvote from @postpromoter courtesy of @cryptosenpai! Did you freeze withdraws from the available balance? Great update to the platform. Nicee! Thank you! Question though! The "At what price per STEEM per week:". Alright. But I do get the 3000 SP at once for the 80 Steem? :) Just want it to be fully clear haha! You're amazing. Thanks for the clarification. You're a hero! These are some great new purchases to consider. Making me feel like I should increase my position of delegation to the @minnowbooster bot today. for example if I rent 1000 sp for a week, and I pay the price of 6.667, and in addition I pay 150 sp for this week ... what am I going to earn afterwards? it's totally nothing ... is not it? .... Please explain me this problem so that I can start the lease by next week .... thank you all. Just to Increase worth of my Upvote becasue Only SP Gives worth to Upvote So How I Will Do it ?? "How many SP per STEEM per week:"
I'm satisfied with your market, but current APR is quite high. Leasing power from investors can help you grow your account? I upvote your post. If you have time, you can upvote this one in return. I hope someone fills my request at 400. I really hope. If someone's SP is sitting reduntant, I dont think the SP per Steem per Week should bother him. Just take my Steem and give me that much needed SP. Haha! Thank you for the option. How does one undo a lease? Thanks. Thank you. I left a similar message on a similar site that I think has similar team members. But Just gonna go ahead and leave this hear as well. This is helpful info. Much appreciated. I'm getting back into my own flow of things on steemit, but I am also helping others locally. I currently host a live Steemit Bitcoin Happy Hour at The Improv Shop here in St Louis. I am leaving a link here for your info in case anyone on your team is in the St Louis area or in case you want to pass on the info. It is mostly newbies attending, but I am doing my best to give them useful info and answer questions. I realize it is hard for a new person on steemit to actually make any gains without joining a "guild" or a "buying" votes, so I am not misleading my friends, and just trying to empower them with the reality that steemit requires one to participate in minnowsuport or minnowbooster or steemvoter. I myself am interested in one of these, but i don't know which one yet. Sorry if this message is a balanced response vs blind faith. But please don't think I am doubting your service, on the contrary, I see it benefitting others. I am just trying to do my due dilligence to empower others who i see weekly on a regular basis. I will hope to learn more about your service. In the meantime: here is my post on the St Louis Steemit Bitcoin Meetup. https://steemit.com/life/@jacobts/st-louis-steemit-bitcoin-happy-hour-meetup-2 Feel free to leave any feedback for me and my fellow improv newbies here or on my post. This is not a request for upvotes, this is simply an overly thorough greeting and hope to continue a productive conversation. Cheers. Thanx you so much dear @minnowbooster for your gd information. I will keep it in mind in the future when I have to rent power, excellent guide. Having delegated a nice share of my steem power, I haven't received my SBD payment for 2 days, is there something wrong? How long does it take for you to make your ROI? I didn't get my Market Delegation payout yesterday. Was MinnowBooster down? Just wondering what is going on. I have a question, i dont have steem but i have SBD, so can i rent out your SP to grow my steemit account . Thing is everything is pretty clear in here in this post but i am a first timer to rent out SP for my account. I've been searching about minnowbooster and watching lots of videos about it the only thing i couldn't understand is my question i asked. Kindly clear this up for me ASAP. Shoot, i did the other way... now it will take about 3 and half to complete the process. can i cancel that by any chance, i mean i have no idea how to cancel the conversion process of SBD to steem. Parting with my Steem forever feels so wrong even if I get SP for a month. Why should I wait 3 days to be Lease SP !!! Is this a condition or what !!!! This is great. This is really helpful for all new comers. How much steem power I can get for 1 week in 20 steem? 3000 Steem power? I want to change to the new offer. @reggaemuffin can u do calculation to increase nett apr to 30%? We have a market and investors decide themselves what orders they fill and when. So if you look at the market and sort by price, you are on page 3: https://www.minnowbooster.net/market?direction=asc&page=3&sort=effective_price so there are roughly 50 other users who want to pay more than you to get steem power. It the current moment there is a huge demand for steem power and the prices reflect that. Hey Lori, I just filled the order for you before reggae replied. Enjoy! This is another simple question. (1) to where(what ID) should I transfer coin? (2) which coin should I transfer to you? minimum and maximum, if it exists. Hi @minnowbooster, what does the new field "NET APR** (Approx +-1)" represent? Thank you. Spamming memes and violating our TOS will not get you anywhere. And I flagged you for being an idiot. If your brain is half as big as your hate and profanity, please check facts. Are you going to start accepting steem for paid upvotes like @booster did? 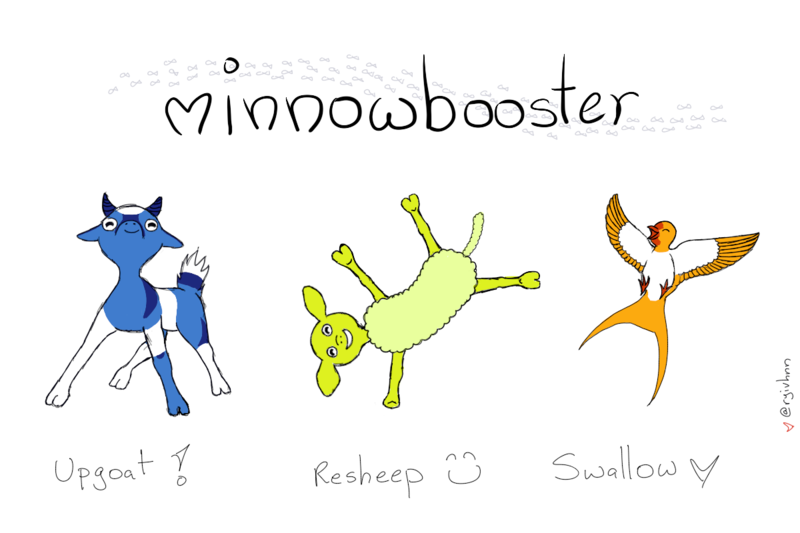 I prefer @minnowbooster but can't justify using it when SBD is so high. What about the regular 185 SP per Steem lease before? That would be wonderful. Even the 215 SP per Steem lease? thank you for sharing. I have a question what price will be per steem to per week? I want 10000 SP for 1 week what would be the price in steem for that?? That is sp lase request if someone instance on it.If fill my request i reall happy. Please tell me how to fill this form. I am unable to understand why increasing sp per steem per week reduces amount of required SP?? If someone getting more power, he should ideally required to pay more sp, however it is working opposite in this case. And what is this net apr and why it decreases upon increment of sp per steem per week?